Simply put, we work to strengthen civic life in all 67 Alabama counties. Our programming includes convening and moderating deliberative public forums, hosting reporting-out events, conducting moderator and convener training workshops, and developing youth leadership and community engagement opportunities. The Mathews Center also authors the Alabama Civic Health Index to measure how Alabamians engage with each other and the issues they care about. DMC signature programs equip Alabamians with tools to find strength in themselves, and their fellow citizens, to find solutions to knotty community problems and pressing public issues. Because we believe that Alabamians should play a role in defining the public issues – and their solutions – that affect their daily lives, we listen as much as we speak. Much of our time is spent in Alabama communities working with an ever-growing network of everyday Alabamians in their capacities as small business owners, university professors, educators, service providers, faith-based community members, and more to strengthen civic life in our state. Over the past decade, this diverse group of partners has remained united in a common goal: to work better together in our communities and across our state. We invite you to join us. To strengthen Alabama’s civic life by increasing active citizenship, community collaboration, and effective decision making. To work with communities to develop and implement innovative programs and resources that foster civic education, capacity building, deliberative decision making, and collective action. David Mathews is president and chief executive officer of the Charles. F. Kettering Foundation in Dayton, Ohio. At the Kettering Foundation, Dr. Mathews has steered the foundation’s research toward studying the role of the public in our political system. Nonpartisan and nonpolitical, Kettering’s research focuses on how to make democracy work as it should. 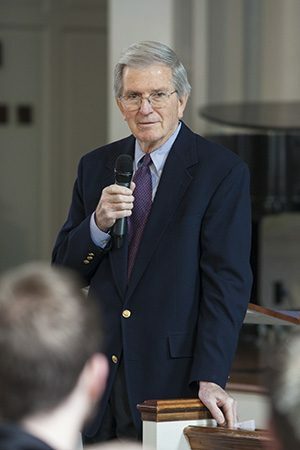 Prior to his work at the Kettering Foundation, Mathews was named President of the University of Alabama in 1969, and at the age of 33, he was the youngest president of a major university. He served as the university’s president until 1980, during which time he was named to President Gerald R. Ford’s cabinet as the 11th Secretary of the Department of Health, Education, and Welfare from 1975 to 1977. Mathews currently serves as Trustee of the Gerald R. Ford Presidential Foundation. David Mathews was born in Grove Hill, Alabama. Received is AB in history and classical Greek from University of Alabama. Served as president of University of Alabama 1969 to 1980. Beginning his tenure as president at the age of 33, Dr. Mathews was the youngest president of a major university. Nominated as a member of the United States Junior Chamber. Presided over the integration of the University of Alabama’s football program under coach Paul “Bear” Bryant in 1971. Mathews was appointed to the Kettering Foundation Board of Trustees. Elected a member of the Alabama Academy of honor. Served as United States Secretary of Health, Education, and Wellness during the Gerald Ford Administration from August 8, 1975 to January 20, 1977, where he worked on restoring public confidence in government. Received Educator of the Year award from the Alabama Conference of Black Mayors in 1976. Received Nicholas Murray Butler Medal in Silver from Columbia University. Received the Brotherhood Award, National Conference of Christians and Jews. Mathews became president and CEO of Kettering Foundation. Inducted into University of Alabama College of Communication and Information Sciences Hall of Fame. Inducted into the Alabama Healthcare Hall of Fame. The Alabama Center for Civic Life was renamed in his honor as the David Mathews Center for Civic Life.